… indeed! 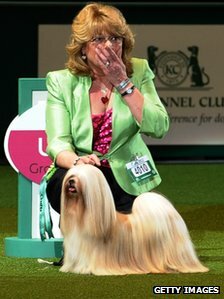 And that would be a Lhasa Apso taking Best in Show at Crufts by a breeder/owner/handler. Elizabeth and her breeder/owner/handler, Margaret Anderson, defeated 21,000+ other dogs at the world’s largest dog show to claim the title. Just a beautiful, beautiful Apso and a veteran at 7 years of age. Congrats to all involved! Oh, my god! Please don’t let them become the dog of the moment! But Congrats! Lhasa’s are over looked and under appreciated. I’ve owned and raised Lhasas for 38 years. No two are alike. God love the little fur-balls!